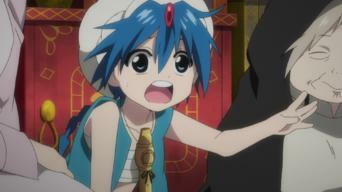 How to watch Magi: The Labyrinth of Magic: Season 1 (2012) on Netflix Netherlands! Sorry, Magi: The Labyrinth of Magic: Season 1 is not available on Dutch Netflix, but you can unlock it right now in the Netherlands and start watching! 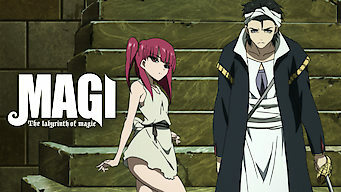 With a few simple steps you can change your Netflix region to a country like Canada and start watching Canadian Netflix, which includes Magi: The Labyrinth of Magic: Season 1. We'll keep checking Netflix Netherlands for Magi: The Labyrinth of Magic: Season 1, and this page will be updated with any changes. 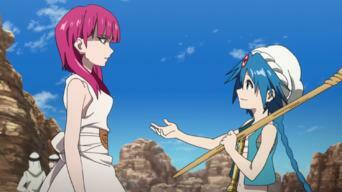 Magi: The Labyrinth of Magic: Season 1 is not available in Netherlands BUT it can be unlocked and viewed! A land of mysterious ruins and a magical treasure hunt await young Aladdin and his courageous friend Alibaba for the adventure of their lives. Classic characters meet mind-blowing new magical adventures with treasure, friends -- even a genie. Bring on the fun! 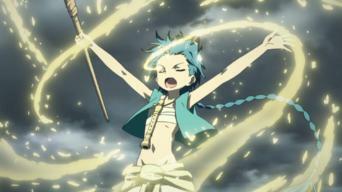 Season 1 of Magi: The Labyrinth of Magic has 25 episodes. Because different Netflix countries have different availability for episodes, you'll need to check the episode listing below to see which are available in the Netherlands. Alibaba and Aladdin, who both long for adventure, become fast friends and set out to pursue their shared dream of finding long-buried treasure. 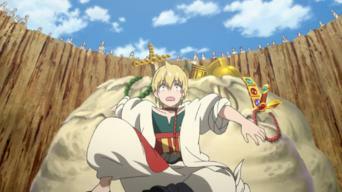 Aladdin and Alibaba navigate a treacherous dungeon with help from the sacred spirit Ugo, who draws on Aladdin's energy and slowly saps his strength. 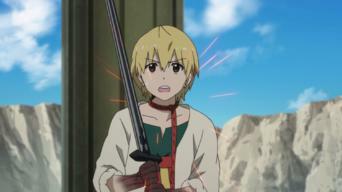 Aladdin and Alibaba make it to the inner chamber of the dungeon, only to face Morgiana, who is determined to kill Alibaba. Alibaba uses the dungeon treasure to buy Morgiana's freedom, then sets off to find Aladdin, who's been taken in by the once-great Kouga clan. 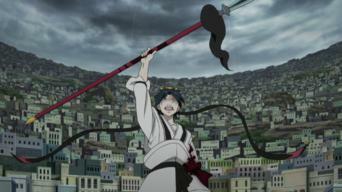 Ryosai undermines Hakuei's peaceful mission to make the Kouga Empire a protectorate. 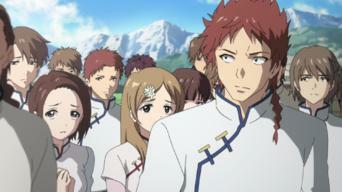 Meanwhile, the Kouga Clan prepares for battle. Morgiana's journey to Balbadd is almost at an end when thieves attack the caravan and a slave trader takes her captive. The kingdom of Balbadd long flourished as a center of trade, but it's prosperity is now threatened by a clan of thieves known as the Fog Troop. 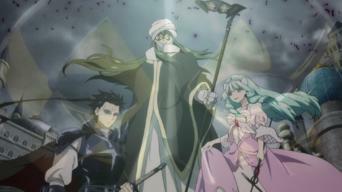 Morgiana steps in when Alibaba turns his back on his friendship with Aladdin to focus on leadership of the Fog Troop. 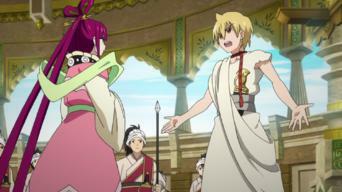 Alibaba tells Aladdin and Morgiana of how he came to forgive Cassim's treachery and join the Fog Troop in its fight against King Abhmad. Alibaba pleads with Abhmad for the people's welfare, but the king ignores him as a mysterious priest named Judar arrives at the palace. 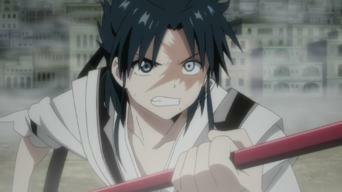 As a battle begins between Aladdin and Judar, Ugo breaks free of Aladdin's control, and Kou princess Ren Kogykoku is drawn into the feud. 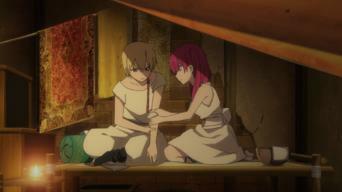 Sabhmad issues a grave warning to Alibaba, who turns to Sinbad for advice. 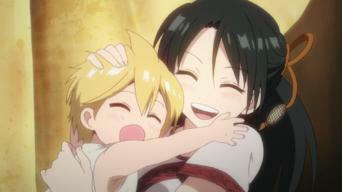 If Alibaba doesn't assume the throne, Abhmad will enslave all of Balbadd. 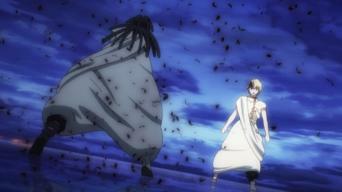 Alibaba reaches the palace grounds, where he's confronted by Abhmad's monkey army, but Morgiana fends them off until he can reach the throne room. Realizing the futility of convincing Abhmad to give up the throne, Alibaba announces that Balbadd will be a free republic. 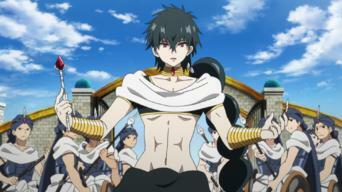 Cassim responds to the formation of the Balbadd republic by convincing the population that the royal family must be punished for their crimes. 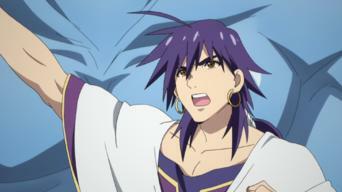 Cassim, now transformed into a Dark Djinn, wreaks vengeance on the palace denizens. 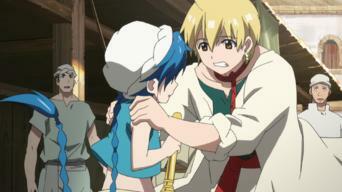 Meanwhile, Alibaba, injured in the attack, gets unexpected help. 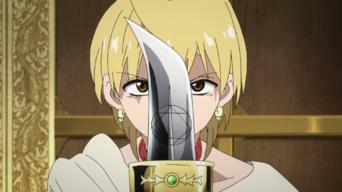 Alibaba helps Aladdin restore Amon's damaged sword, then attempts to bring Cassim, who's been turned into a Dark Djinn, back to reality. 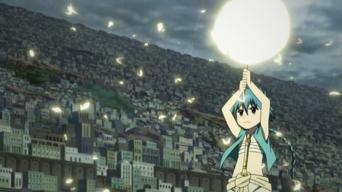 An armada of ships from the Kou Empire nears Balbadd as Alibaba races to rebuild the city. 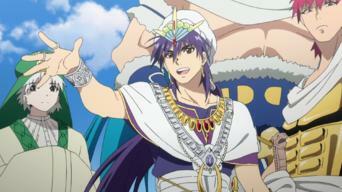 But Sinbad, seeing a lost cause, urges him to flee. 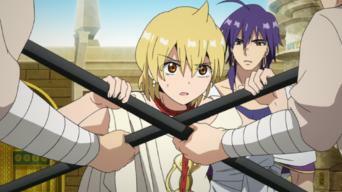 As Aladdin and Alibaba train with two of Sinbad's Eight Generals, Princess Kogyoku arrives in Sindria to make a shocking accusation against Sinbad. 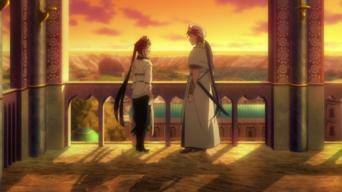 Sinbad tells Hakuryu to seek knowledge of the outside world from Alibaba, who hears strange, ominous voices while in Hakuryu's presence. 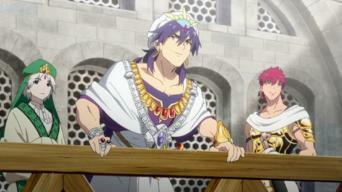 Hakuryu joins Aladdin, Alibaba and Morgiana on his first dungeon-capturing quest. 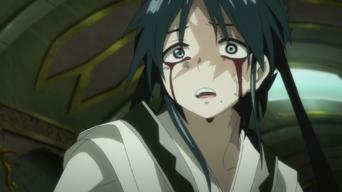 Along the way, Alibaba hears a disturbing voice inside his head. 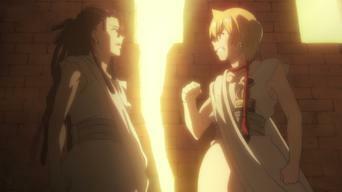 Hakuryu allies himself with Alibaba, and they join forces with the other Magi to capture Zagan. But an unseen foe is about to challenge their quest. 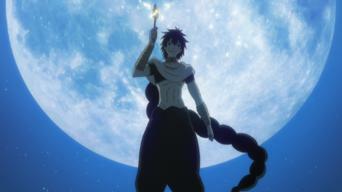 Aladdin and Alibaba are left alone to confront Ythnan, Dunya and Isaac, whose powers grow as they summon dark forces during the battle. The Kingdom of Sindria fends off an attack from Al-Thamen, as well as an ominous entity looming toward the battle and Dunya's Dark Djinn. When Al-Tharmen's assault on Sindria proves to be a diversion, Alibaba is taken captive and only his friend Aladdin can guide him out of the darkness.